In addition to other issues connected with the EU referendum (e.g. 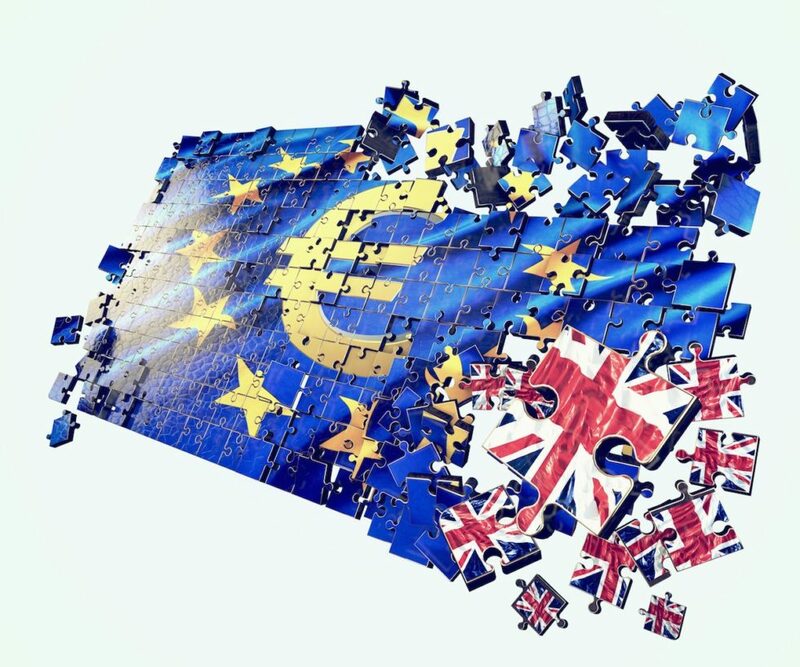 EU immigration, EU benefits tourism and housing crisis and the EU), Britain is currently hotly debating the crisis in the health system or the National Health Service (NHS). It is not unusual for segments of the British media to lead with headlines such as “Migrants are pushing NHS to breaking point,” claiming that the NHS has been left “on its knees” by “uncontrolled migration” from the EU which has merged with the theme of “health tourism” or the practice of travelling abroad in order to receive medical treatment. The implication is that EU migration / benefit tourism is at the root of the problems of the NHS. So this post addresses the nature of the UK health crisis and the extent to which it is attributable to the EU migration and health tourism. The National Health Service (NHS) is the largest and oldest single-payer healthcare system in the world. It is primarily funded through the general taxation system that is overseen by the Department of Health. The NHS is built upon the principle of comprehensive health service provision based on clinical need, not ability to pay. The NHS provides healthcare to every legal resident of the UK, with most services free at the point of use. When created after WW-II, the NHS was the pride and joy of the pioneering British welfare state and served as a model for many other countries. But the fact is that the NHS has been in crisis for decades going back to at least the 1980s. As Britons are well aware, wave upon wave of health reforms have sought to cure its ills yet the NHS remains as sick as ever. The starting point in the health debate is to acknowledge that the problems with the health system predate the influx of EU migrants to the UK which started in earnest in earnest 2004 and continues to this day. The NHS’ problems did not begin with EU immigrant and will not end if migration were suddenly to end, regardless of whether migrants originate from the EU (less than half of UK immigration) or elsewhere (Britons returning home, Commonwealth, students, etc. – more than half of the immigration). The second point is to recognise that the challenges facing the NHS are many and varied, not least connected with an ageing population and the impact of modern diseases such as diabetes, obesity, cancer, etc., combined with escalating costs of procedures, medication and so on. 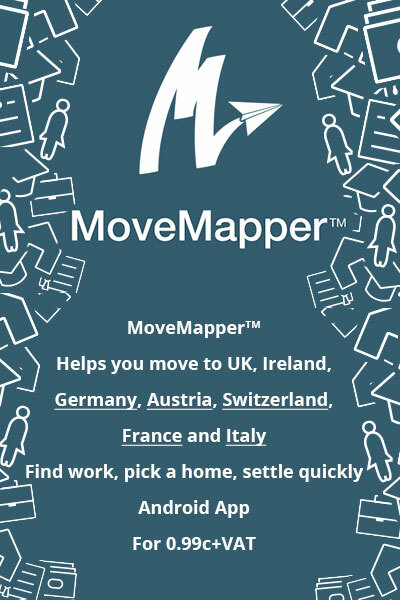 The health professionals are in the best position to assess the issues and whether those issues are connected with migration or not. 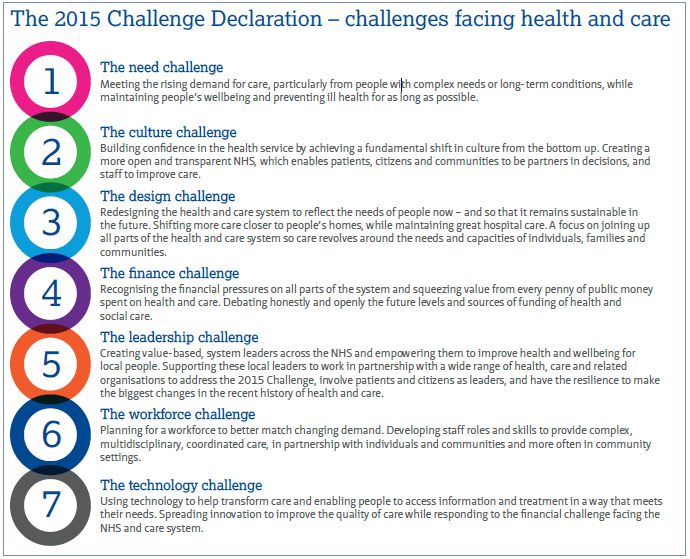 In a recent publication “Challenges facing the NHS in England: a guide for MPs and Peers”, the NHS Confederation (representing over 500 NHS organisations that commission and provide health services, including hospitals, community and mental health providers, ambulance trusts and independent sector organisations providing NHS care) set out the main health challenges facing the health system. These are illustrated in the diagram below. Neither immigration in general nor EU immigration specifically figures as a health challenge. There is no reference to NHS creaking / breaking / lack of sustainability due to migratory pressures. This is hardly surprising since all the evidence is that EU immigrants tending to be younger, better educated and in better health than the average Briton in the labour force. We tend to consume disproportionate amounts of health services as babies/children and as pensioners, especially after the age of 75. Young adults – the typical EU migrants – put relatively few pressures on the health system. Rather, the Call for Action focuses on areas about which there is little controversy among the 500 health professionals in the NHS Confederation. They stress the need for stability if the NHS is to tackle its challenges (endless reforms); the need to increase staff (too few); the necessity for social care funding for people with long-term illnesses; the need to make mental health services available and accessible, etc. The most critical issue by far is the finance challenge; this is the underlying reason for the continuing problems faced by the NHS. The point to note is that the UK is exclusively responsible for the resources that it devotes (or not) to the NHS. No amount of finger-pointing in the general direction of the EU will alter this particular fact. Furthermore, the NHS funding challenge is nothing new: it predates and supersedes other factors such as EU migration. 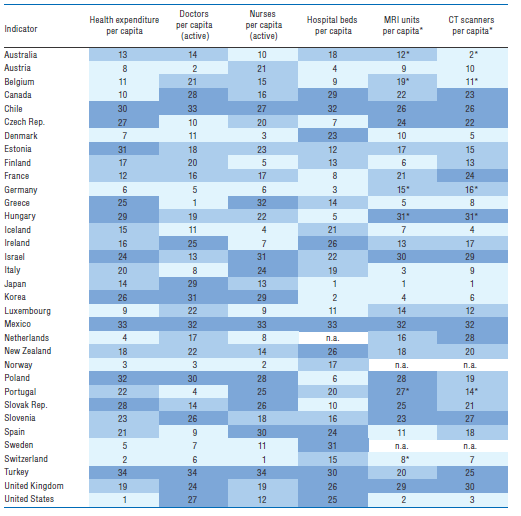 This is the fundamental reason why the NHS has been gradually overtaken by other countries, as illustrated in comparative research among OECD countries highlighted in the Table below. 30th in terms of Computer Tomography (CT) scanners per capita. Some countries, such as Germany, have even higher levels of EU immigration than the UK yet it comfortably outperform the UK in terms of the selected health indicators. Money, or rather the lack of it, is clearly an important reason for why the NHS is in the state that it is. The UK’s austerity measures, which have been in place since 2009, included severe budget constraints with zero growth in health spending per person in real terms. On a per capita basis and as a share of GDP, health spending in the UK is slightly below the OECD average. Lack of financial capacity is clearly not the issue. Rather the UK government chooses to prioritize other public expenditure, such as defence, over the heath system. Furthermore, the situation is set to deteriorate: the NHS Confederation estimates that the gap between increasing demand for care and the funding available will be at least £30 billion by 2020. The key point is that other economies choose to put more resources into their health systems than Britain. The state of the NHS, by and large, reflects this particular policy prioritisation. Transferring the entire net budget that Britain spent in 2015 on the EU into the NHS, namely £8.5 billion (2014) would not make that much of a difference in the projected NHS deficit of £30 billion in 2020 for England alone. The Vote Leave campaign misleads in suggesting that cancelling one (EU contribution) will solve the problem of the other (NHS crisis). EU health tourism: where’s the beef? There are “risks” perceived in some quarters, such as the EU’s Working Time Directive (WTD), which limits work to a maximum 48-hour week and lays down minimum requirements for rest periods and annual leave. But can critics really sustain the argument that the health profession should work longer hours than other professions? Most people would not agree. When it comes to a critical matter of life and death, most people would want a doctor / nurse / surgeon who is neither exhausted nor overworked (we all recall UK health workers, especially junior doctors, having to work absurd and dangerous numbers of hours in the past) when attending to their health needs. The WTD applies to all 28 countries and all professions; I see no reason for making an exception for the UK or for the NHS, though this does not preclude the possibility of fine-tuning the WTD. There is also freedom of movement of doctors and nurses from across the EU working in the health system in the UK. This is actually a very good thing for the NHS, as acknowledged by the government’s official report: “In terms of health professionals, there has been a very positive impact for the NHS as 10% of NHS staff are from European Economic Area (EEA) countries, without whom there could be staff shortages.” For example, the Royal College of Midwives, has stressed that Britain would be hard-pressed to find enough midwives and nurses trained in the UK to replace the 33,000 from other EU countries who currently work in the NHS. It is not only an issue of the damage that staff shortages might cause in such a sensitive area as the heath sector. The issue which those interested in improving the health system should be focusing on is exactly why Britain continues to be completely incapable of training a sufficient number of its own health professionals. I recall nurses and midwives being sourced from Ireland before the EU and the rest of the world became the NHS’s recruitment pool for health workers. No open-minded individual can fail to see Britain’s gain in this form of EU migration. If anything, other nations might well criticise the NHS’s beggar-thy-neighbour recruitment strategy (i.e. a policy by which one country attempts to remedy its economic problems by means that tend to worsen the economic problems of other countries) which basically mops-up experienced doctors, nurses, midwives, surgeons, etc. which other countries have paid to educate and train. There is also the Cross Border Healthcare Directive which allows individuals to purchase health care and treatment from a provider in another Member State. This is supported by the health industry in the UK since it offers them the prospect of widening the sources of income by attracting EU patients and using excess capacity in the health system, for example in specialist areas such as diagnosis and treatment of rare diseases. Furthermore, under the current NHS arrangements, patients in one location of the UK are not free to seek treatment in another part where waiting times/lists may be shorter. However, the Cross Border Healthcare Directive enables them to seek treatment in other EU countries if they wish. This is a good thing: it allows patients to control their own health needs. Something that puts power in people’s hands over vast bureaucracies, for that is exactly what the NHS is, must be a good thing. There is limited reliable data on the use of health services by immigrants and visitors, making robust estimates difficult. That said, the available evidence suggests that use of health services by immigrants and visitors appears to be lower than that of native Britons, as previously discussed, not least because immigrants and visitors are, on average, younger. In 2014 an official report (Quantitative Assessment of Visitor and Migrant Use of the NHS in England), showed that EU (27 countries) and EEA (3 other countries) visitors and non-permanent residents cost the NHS an estimated £305 million, of which £220m is recoverable by England under the European Health Insurance Card (EHIC) scheme. Every EEA country issues EHIC cards to their citizens, thus enabling them to receive healthcare whilst on a temporary visit to another EEA country on the same basis that is provided to its own residents. People go on holiday in the EU/EEA knowing that if they fall ill or have an accident they will be able to access health care without the need for separate insurance. This saves time, effort and money for all and is widely considered a good thing. Department of Health data for 2012-13 show that only about £50m was recovered from the EEA countries compared with the £173m that the England pays for British visitors to EEA countries. This means that the NHS / Department of Health are not claiming as much of the money that they are eligible to receive from the EEA countries as they could. Some forget that this is not a one way street; it is not only EU nationals that come to the UK and use health service here. Britons also make a good deal of use of the health services in other EEA countries and the costs more or less balance out: £220m worth of health services received by EEA people in England, compared with £173m worth of services received by people from England in EEA countries. The low percentage of recovery (22.7%) is due to one reason and oner reason only: NHS inefficiency, which is an issue for the UK to rectify. Why should Britain need over a decade to set-up a working reciprocal health cost management system when the other 27 nations have long ago managed to do so? It has been argued that there is a lack of knowledge among NHS healthcare professionals as to who is eligible for free treatment. Can this really be so fiendishly complicated as to systematically defeat the British health care system with its new generation of sharp suited, MBA educated management? Surely it is not like expecting the NHS to crack the health equivalent of the Enigma Code. Rather than voting to Leave the EU for a problem that can only be pinned on Britain itself, it might be more effective to set-up a system to check if an individual is from the EEA and train healthcare professionals to recoup the costs of EU patients, as Britain is fully entitled (but fails systematically) to do. Interestingly but not surprisingly the actual health costs of EEA migrants are very low, despite all the emotive talk of “EU migrants / freedom of movement pushing NHS to breaking point” and “NHS is creaking under the strain of immigrants” emanating from the Vote Leave EU group such as Priti Patel and others. The annual NHS budget in England was worth £116 billion in 2015/6, so EEA migrants used-up 0.26% of the annual NHS budget (£305 million). When the costs that could have been recovered from EEA countries are taken into consideration (on the assumption that the NHS ever gets its act together), the percentage would drop to 0.18% (£220 million). There would appear to be vastly bigger fish to fry when it comes to saving costs in the British health system. When this analysis is extended from England to the UK, the same health competences report noted that in 2012/13 the UK paid a net £805 million to EEA countries to cover the healthcare costs of Britons, especially pensioners, living in other countries. This sum illustrates just how many UK citizens benefit from the EU health provisions. In other words not only do more British pensioners benefit from the system than EU pensioners gain from using the NHS but it would cost the NHS more to provide health care to those 400,000 Britons currently living in Spain (and potentially many others, since there were about 1.4 million Britons living in the EU) if they came back. The Vote Leave EU campaign would find it hard to swallow the point that EU health provisions may actually be saving British taxpayers money (and/or that the savings are being recycled for the benefit of the health of the people in Britain). It should be noted that the NHS (Charges to Overseas Visitors) Regulations Act of 2015 requires hospitals to charge overseas visitors (not ordinarily resident) for the NHS services that they provide in a hospital or provided outside by staff employed by a hospital. GP services and services provided outside hospitals are not chargeable. So it would appear that Britain is well on the way to meeting the public concerns about the costs of health for visitors, whether from the EU or elsewhere. The UK’s competences review concluded that, on balance, the EU’s engagement in the health sphere is appropriate and noted the major advantages of EU health directives, including the IHIC card, the number of EU educated nurses and doctors working in the UK and the capacity to access European level health services. There are real benefits for health institutions and citizens across EU countries. In terms of the major health challenges facing the UK in the future, the 500 NHS Consortium health institutions did not identify immigrants as an issue: money or rather the lack of it is the key issue in Britain. The evidence is that EU/EEA citizens use the NHS intensively less than native Britons. In any case, Britons make extensive of health services in EEA countries, especially those that retire in Spain, France and elsewhere. The EU introduced health transfer arrangements to ensure that each EEA nation pays according to the health services absorbed by their nationals. This is fair but it is up to each country to introduce the necessary systems and procedures. After a decade, the NHS is still unable of charge its share, which means that instead of EU nationals costing the NHS 0.18% of its annual budget, it actually costs 0.26% in England. Boris Johnson, Michael Gove and other Vote Leave campaigners may insist that the “billions spent on the UK’s EU budget contribution to be spent on the NHS.” That is fair enough but let us not pretend that this will solve the problems in the health system at a stroke. Even if the GBP 8.5 billion net EU contribution were poured in its entirety into the NHS tomorrow, nothing would change fundamentally because the financial need is much greater than this contribution. Can it realistically be argued that EU migration / health tourism is pushing the NHS to breaking point, especially when large numbers of Britons and British pensioners living in the EU are actually reducing the costs to the NHS since the costs of health provision in Spain and elsewhere are lower than they would have been in the UK? I don’t think this is such a bad health deal for Britain and is not a sufficient reason for voting to leave the EU in the forthcoming referendum. Is the EU responsible for the state of British health system: the EU ensures that all EU citizens have access to health services in all countries at no extra cost or hassle. Is the British government responsible for the state of British heath system: the UK is 100% responsible for national health provision and the health budget. The UK chooses to invest a smaller amount on health than other countries and this is the root cause of the health problems. Pumping Britain’s entire EU annual contribution in the NHS will not change the fundamentals of the health system, though it would certainly be helpful. Should I vote to leave the EU because of EU health tourism: EU nationals make less use of the NHS than do native Britons. Also, there are more retired Britons living in EU countries and making use of other EU health systems than there are EU nationals living in the UK. Both save the NHS money and/or allow resources to be focused on health services in Britain.